(0:13) BREAKING / SMASHING ICE: Thick ice is smashed on a frozen pond. Clear crunching and smashing sounds as the ice is broken. This CD quality WAV file will play with any media player and is easily edited inside any audio software (preview contains a security tone). 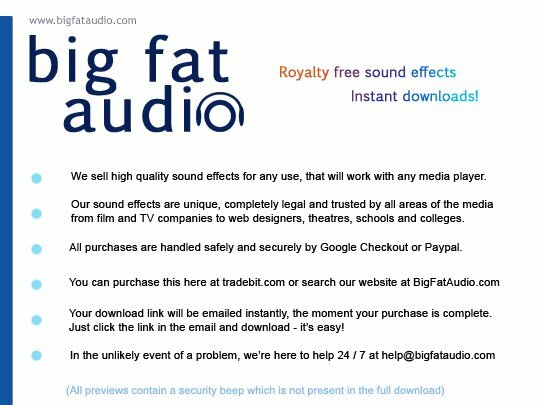 This download remains the copyright property of BIG FAT AUDIO and is intended for embedded use only. You are not permitted to re-sell or offer the sound effect for free download elsewhere. If you wish to use this sound efect inside an application intended for mobile devices such as the iPhone, such use is not permitted at this price - please contact us for an upgraded license. If you have any queries or problems relating to your download, please contact us.